I am trying to get the form on the "Events" page (link to events page in the right sidebar on home page), to redirect to a custom Thank you page after the form is submitted. When a form is submitted, the error I get is "page not found", as seen in the screenshot below. I tried redirecting it to other pages on the site (to see if I had typed anything in incorrectly), but found I was still getting the same error. When I use the default thank you message, it works fine. Do I need to redirect it to an .htm verses an .html? I'm just a little confused, because when I loaded this site, new to the web, a couple of weeks ago, I tested the form and it worked perfectly. Then I got an email from a client that when a customer submits the form, they get the "page cannot be found" error, and then they go back and fill out the form again. Though the form is being submitted correctly, the thank you page is not being redirected. I believe the problem is with the custom thank yyou page that you assigned for your form. 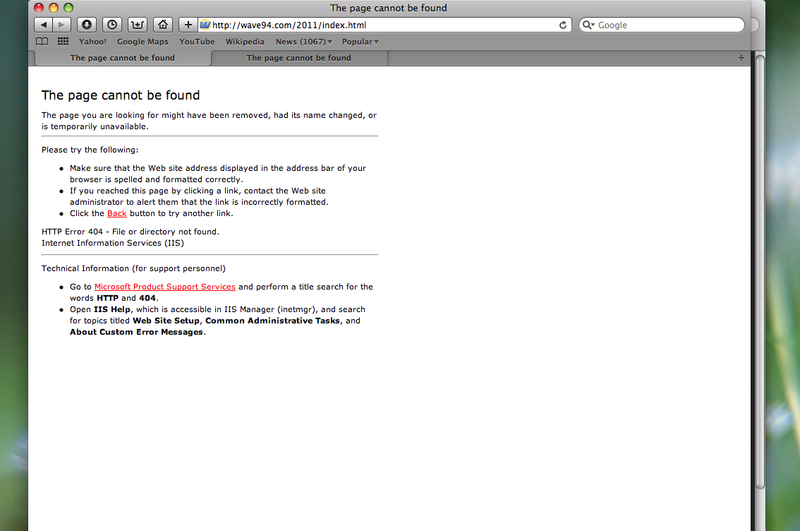 I tried opening the page http://www.wave94.com/2011/events.html but I also got the "Page cannot be found" error. Please double check if the page is still existing in your directory, or if the filename has been changed. Both htm or html should work perfectly. Apparently, since I am already 'telling' the server to go directly to the "2011" folder, it does not have to be listed. Life is a never-ending learning process, ain't it? Glad to know you're able to figure out the problem. Thank you for the kind words as well!